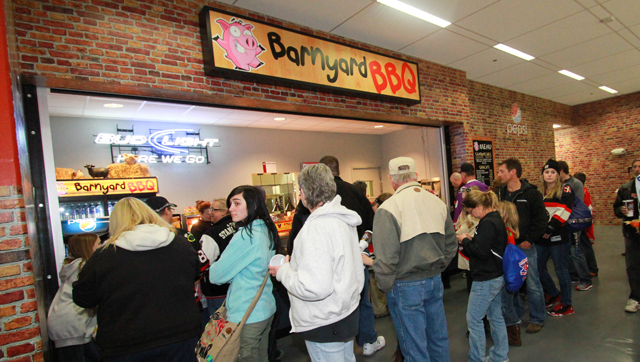 Barnyard BBQ- From Pulled Chicken to Pig Slop, Barnyard BBQ cooks up it all to satisfy any BBQ lover's taste buds and is a consistent Fan Favorite! 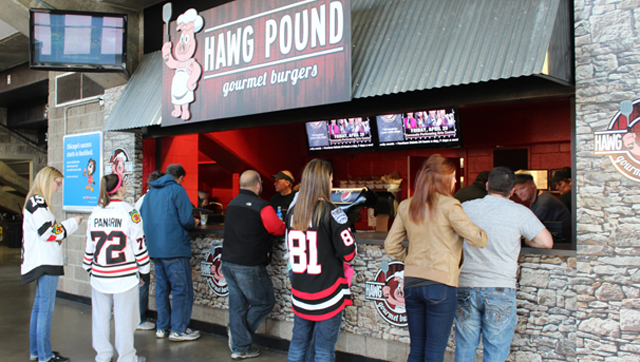 Hawg Pound- What is a concert or hockey game without the perfect burger? Check out Hawg Pound's Fan Favorite Bacon Cheese Burger when enjoying your visit to the BMOHBC. Oak Leaf- Stop by Oak Leaf for your taste of Oak Leaf's own Fan Favorite Cheese Curds. A&D Concessions- Ice Cream, Cotton Candy, and Sno Cones. Barnyard BBQ- Pulled Pork, Pulled Chicken, Boneless Wing Basket and Pork Tenderloin. Blue Flame Grill - Bratwurst, Hot Dog and Nachos. Hawg Pound - Bacon Cheese Burger, Italian Beef, Cheese Burger with Pulled Pork. Oak Leaf - Chicken Tenders, Cheesy Fries, Pork Tenderloin. Popcorn Portables - Popcorn, Pretzel with Cheese, Theater Size Candy. Rock City Pub - Craft beer and Whiskey bar. Taco Cart - Gourmet Nacho's, Chicken/Cheese Quesadilla, Jalapeno Pretzel. Bars - Mixed Drinks, Craft Beer, Specialty Beer, Domestic Beer and Wine. Are you looking for fundraising opportunities in the Rockford area? 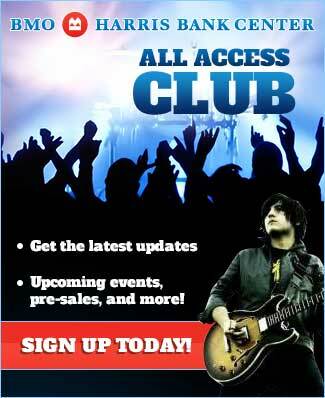 Does being a part of the Rockford IceHogs, special events and premier concerts excite you? If so we have an opportunity for you! We are currently recruiting Not for Profit organizations to work with us in the food and beverage operations. This opportunity offers an exciting and energetic environment while providing tremendous fundraising opportunities for your organization. Our fundraising efforts have helped raise upwards of $300,000 in recent years and we want you to be part of the excitement! E-mail Donna Johnson at djohnson@smgrockford.com or call her at 815-489-8210. All concessions and catering services at the BMO Harris Bank Center are provided by Savor Food and Beverage.